While Kerry was helping out with the wreaths at Arlington, I was negotiating on how many Kleenex it would take to clear out Miss H’s congested nose. She claimed it would be a whole box because, “it’s really full.” She was so concerned about the need for Kleenex that I have been walking around with a box in my bag. Then it was off to gymnastics for running around and bouncing on the trampolines. Class was a little stressful because they mixed up the usual order and the balance beam (favorite part) got demoted to last. Someone was not a happy camper about the whole switcharoo but we survived. I spent my Saturday afternoon catching up with friends at an annual cookie party. My week was so busy that I ended up not making cookies and just bringing an appetizer. Luckily, there were extra cookies to take home. The cookies were all delicious but Miss H only found a few she liked. “I don’t like chocolate,” she repeated over and over as she sorted through my cookie loot. Looking at me like I should not have bought home the chocolate ones. She did not quite grasp my explanation that the best cookies have chocolate in them and that she was totally missing out on the delicious goodness. Somehow I ended up with a husband and daughter who don’t like chocolate. Oh well, more for me. 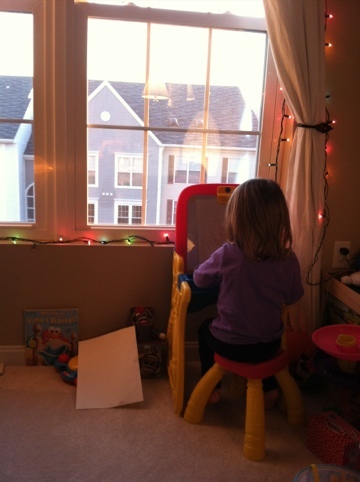 One of her favorite activities is just sitting at her easel and drawing. It is pretty cute to watch. She so intently draws and talks about the colors. 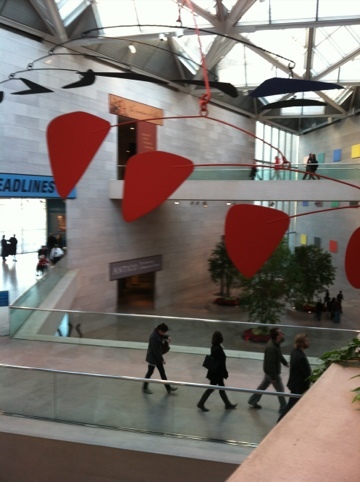 I still love the Alexander Calder mobile at the National Gallery of Art. Now, I am exhausted. Hope everyone had a great weekend!